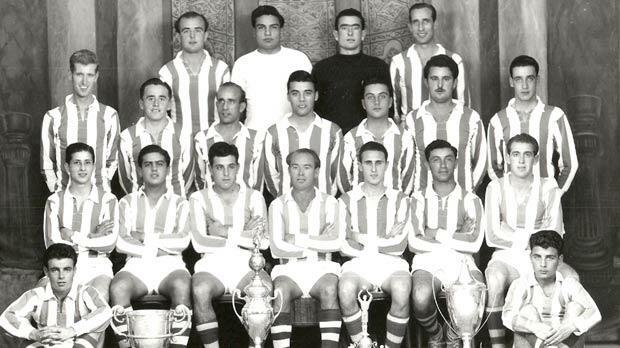 Floriana FC 1952-53 – league champions and FA Trophy and Cassar Cup winners. The 1952-53 FA Trophy competition was started very early in the season. This was never a good idea, particularly in those days when only the eight First Division clubs took part. Experience showed that when the knock-out competition was not held at the end of the season a lot of the interest was lost. This was especially true for those teams who were eliminated early on and then had nothing to look forward to after a poor league season. In 1952-53, the competition was started on October 26 when Sliema Wanderers beat St George’s 2-1 to win a place in the semi-finals. The Saints went through a very bad season and at the end of the campaign they finished at the wrong end of the table. In this game, however, they gave the Blues a good run for their money. The game was fast and had all the ingredients of a cup-tie but, after a thrilling first half, there followed 45 minutes of hacking, going for the man, and all the other things which mar the game. The quarter-final between Floriana and Ħamrun Spartans was played more than four months later. Although the Spartans showed a marked improvement on their league outings, Floriana cruised home safely to a 3-1 victory. The Rabat Ajax vs Birkirkara encounter was more balanced. The crowd was treated to the usual kick-and-rush tactics of cup-tie football. Birkirkara were having a very good season and they were expected to win this game hands down. A penalty two minutes from time, however, gave the Magpies their ticket to the semi-finals. Valletta had Salvinu Schembri missing when they met Hibernians in the quarter-final. But, the Citizens, however, still romped home easy winners. They won 3-1 but Hibs were a bit unlucky when they were denied a clear-cut penalty. This, however, would not have made much difference. Sliema had, by their own standards, a disappointing year. Their biggest rivals Floriana were already champions and Cassar Cup holders. Sliema’s only remaining chance was the FA Trophy. The Wanderers had this in mind when they met Valletta in the semi-finals. Valletta had other ideas though. They stormed the Wanderers’ fort and, at half-time, they led by a goal from Farrugia. In the second period, Sliema played with more purpose and it was not long before Xuereb equalised. The Blues continued to press until Tony Nicholl scored the winner. Floriana beat Rabat 3-2 in the other semi-final. Rabat maintained their reputation of cup fighters but the match only dragged into extra-time because of a blatant mistake by referee Kidd, of the RAF. With only seven minutes left, Floriana were leading 2-1. Rabat were awarded a free-kick which Alfie Pearson delivered hopefully into the penalty area. In ran Sammut who leapt into the air and piloted the ball with his outstretched hand over Ġużi Alamango’s head and into the net. Everyone saw the incident, except the referee. In extra-time, justice was done, however, and Charlie Azzopardi scored the win-ning goal with a great drive from the edge of the penalty area. The final was played on June 4, 1953. The Old Firm rivals played a cautious game and the match had to go to extra-time before Pullu Demanuele scored the goal which gave the trophy to Floriana. The 1950s were glorious years for Floriana. It was the second time in four years that they made a clean sweep of all the honours. At the same time they established a record of four championship wins in a row which still stands to this day.